I say bites, but you see mini-donuts. You’re probably wondering what’s up..? Story time: one day a few weeks ago I decided I really needed a silicone donut pan to make some raw donuts. 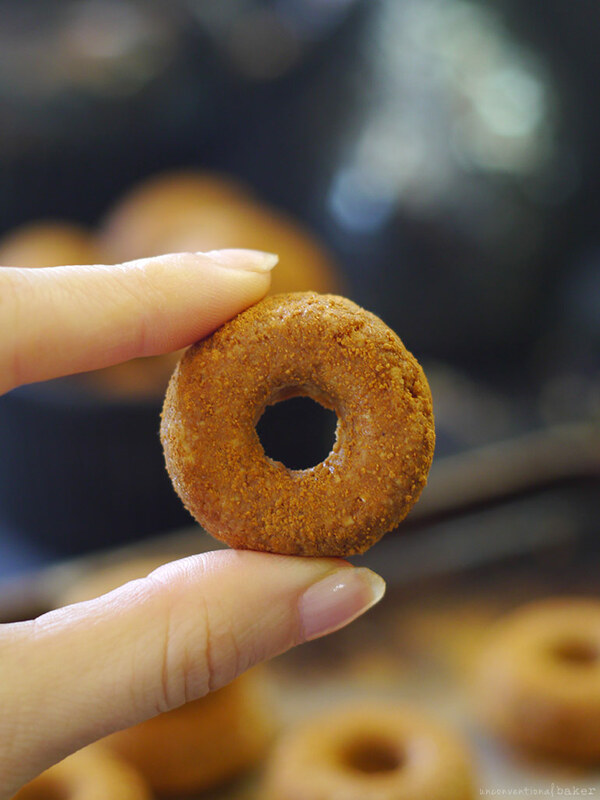 But I didn’t want one of the really big ones, but the smaller sized pan (like this one) that makes these cute mini donuts — the kind I see at the junky bakery aisle at the grocery store all the time (in fact that’s where the hankering for donuts hit me! All those cute little sugar coated donuts in a package looked so enticing). Who knew there’s such a thing as a mini mini donut pan! I mean, this is pretty much candy chain-sized! 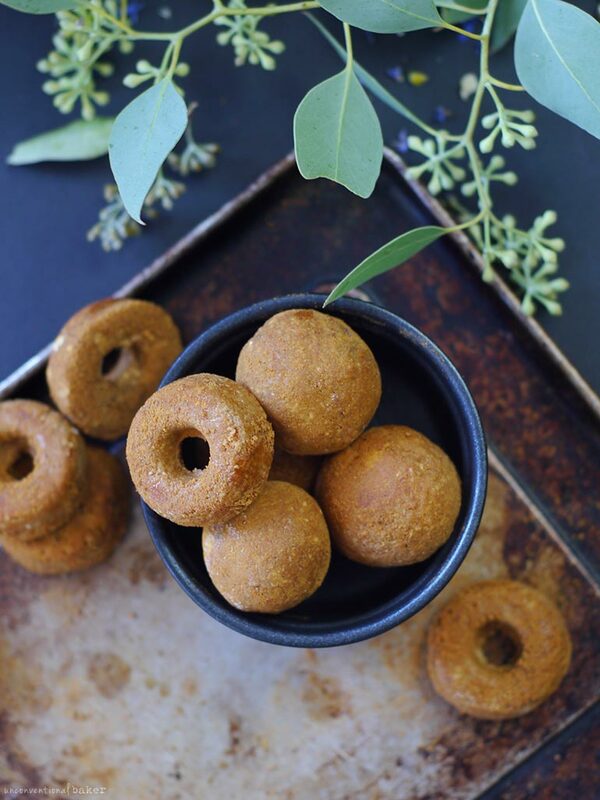 Anyhow, when I went to make these cinnamon oat cookie dough bites, after rolling some into balls I thought, hey why not not make baby donuts while I’m at it… May as well do something with this completely unnecessary accessory in my pantry. So back to these cinnamon bites.. they really are simple to make — ready in no time and they last a good while. I had some at room temp, some in the fridge, and some frozen, and all were put to good use in the end. They sort of taste like a good oatmeal-on-the-go snack. Very satisfying, but also very light somehow. I found they work best taste-wise small, i.e. as bites or bliss balls (as opposed to a large donut, for example). Sorry to the Aussies and for those in countries where there are no gluten-free oats. I tried this out with quinoa flakes for you, and let’s just say that didn’t go over so well… ?. I think this would be great with almond flour and a bit of tapioca or something along those lines, though the ratios would need to be quite different. Satisfying, mini cinnamon bites in a cute donut shape. Make them as cinnamon donut balls too. Light, sweet, perfect snack size. Gluten-free, vegan. No bake. 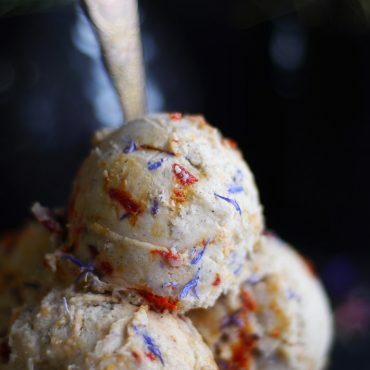 Place all cookie dough bites ingredients in a food processor, except the additional 1 cup instant oats, and process the mixture to combine. Add in half of the remaining instant oats and process to combine, then add the remained and process once again. The mixture at this point should be sticky but not too wet — test if you can pinch the mixture with your fingers or form into a small ball — if it’s too wet, add a bit more oats and process until you can roll a ball with the mixture. 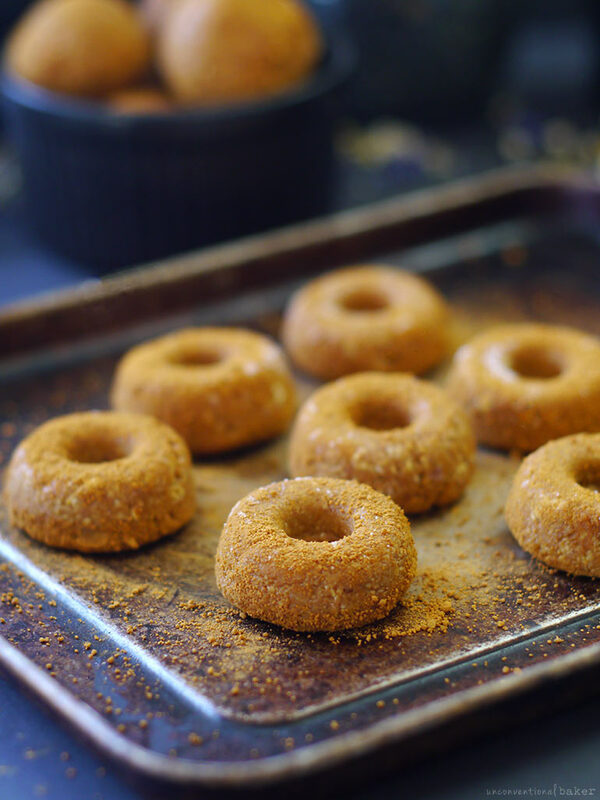 Prepare a tray lined with parchment (or set donut pan on a flat tray if using). Set aside. Stir the coating ingredients together in a small bowl and set aside as well. 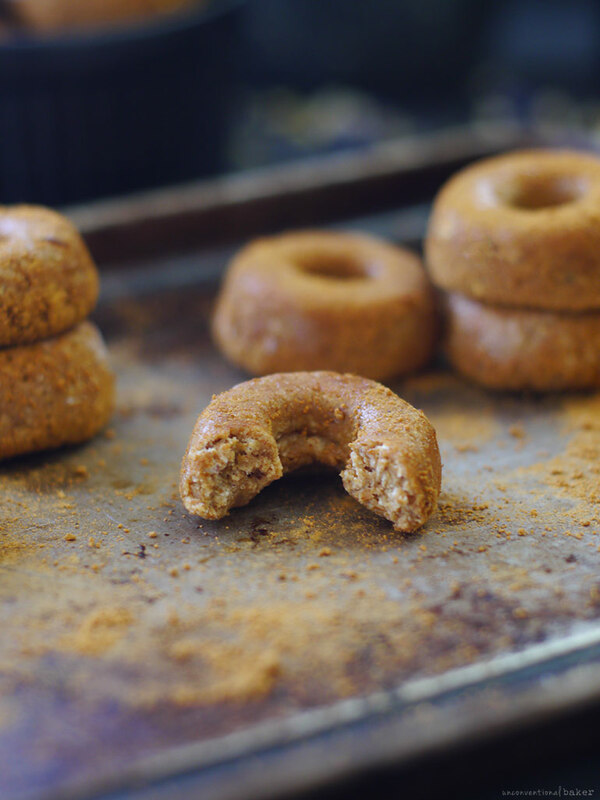 Take out about 1 tbsp of the cinnamon oat bites mixture (or more) and roll into a ball with your hands**. Roll each ball in the cinnamon sugar mixture to lightly coat as you go along, then set on the prepared tray. Repeat until you run out of mixture. 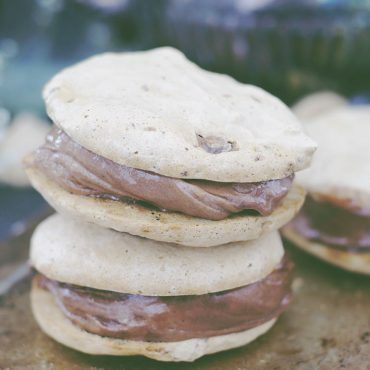 Chill for 20 mins in the fridge, then transfer into an air-tight storage container and enjoy! You can keep them at room temp if planning to consume within a day or two, or keep refrigerated. They also freeze well and thaw out very fast if you want to save some for a longer period of time. *To soak the dates, place measured out pitted dates in a glass bowl, cover with boiled water (or room temperature water if you prefer to keep them on the raw side) and allow to soak for at least 15 mins to rehydrate and soften (if water was at room temp instead of freshly boiled, then soak for about 4 hours). Then strain and discard the water. 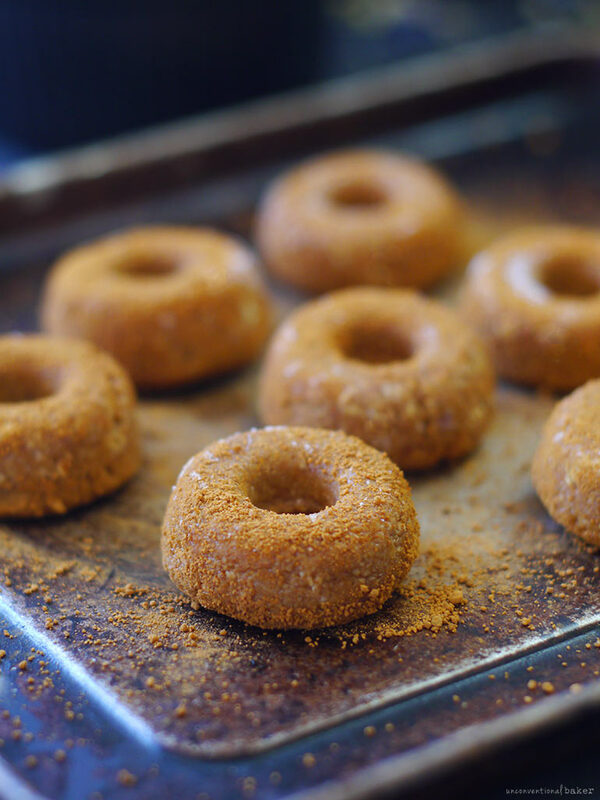 **If using the mini donut pan, press the ball into the mold and shape into a donut shape with your fingers, then freeze for 30 mins and pop out gently. Then coat in the cinnamon coating, chill and enjoy. 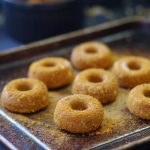 This post contains affiliate links to the mini donut pan I used and the one I meant to use. OMG this sounds and looks so good! Can’t wait to try it, I cant believe its a no bake recipe. I cant imagine how it would get its donut shape without baking it. I love sweet treats, but don’t love fussiness, and most commercial baked goods and I often don’t get along so well, so what’s a girl to do.. ? For my fellow Aussies; I’m fairly certain I’ve seen gluten-free oats in Coles and Woolies/health food stores – Bob’s Red Mill Gluten Free Oats are pretty common ’round the traps, these days! p.s. Oh, and these need to happen to my life and face. Immediately. It’s good to hear there are gf oat options popping up over there though, for those that want to give them a try. There are also some gluten-free oat options available on iherb.com — they ship really fast to Australia and at reasonable prices, and they carry a lot of North American gluten-free brands, including Bob’s Red Mill. So another option to check out if people can’t find any in person. Hehe. Thank you! It’s def entirely possible to demolish a batch in a blink ??. I do not have any enlightening ideas as to why anyone would make a donut pan so teeny tiny, but I actually kinda of love the fact that it exists hehe! Like doll food sized donuts–now we just need the world’s tiniest tea cup to sip alongside☺️ I make some of my best/worst shopping online purchases late at night too and then often wake up like…hmm did I actually buy that or was it a dream I don’t really remember? (Often hoping it’s the latter actually?) Anyways, I am happy that you found a delicious use for it though. Because regardless the shape or size dates + oats + lots-o-cinnamon makes for perfect bite-sized snacking?? Hehe. I sometimes feel like that about my online snack orders… especially on iherb. When the box arrives I’m often thinking… “oh, why did I get that…?? ?” and who’s gonna eat it now ?.